There always seemed to either be something missing or an abundance of effects and tricks intended to cover up a sparse plot. 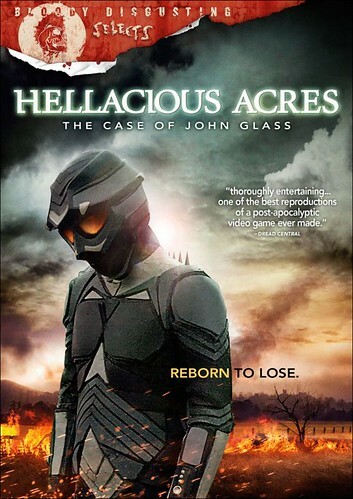 Hellacious Acres: The Case of John Glass tells the story of John Glass, a man who awakens from a cryogenic slumber an unspecified number of years after not only World War III, but also an electromagnetic storm which wiped out all historical records, and an alien invasion or two. Actually, I don’t think they specify how many Alien Wars there were, but since they made reference to “Alien War I”, we’re assuming there were at least two. Earth has been ravaged by these wars and John Glass is given the task of kickstarting a new life for humanity by establishing a livable atmosphere. Suffering from amnesia and trapped in body armor which protects him from the dangerous radioactive elements that fill the atmosphere in this harsh new world, John encounters aliens, survivors, and perpetually failing equipment in this uneven, occasionally beautiful but ultimately disappointing film. Hellacious Acres takes advantage of its B-movie status and revels in it, something I can definitely respect. Using a camera effect similar to the one Robert Rodriguez used in Planet Terror, portions of the film are littered with scratches, hairs, snaps, crackles, and pops that give it that old grindhouse look and attempts to cover up the fact that it was clearly filmed in an abandoned lot or the backyard of somebody’s grandpa. Unfortunately, this effect is used so much that it becomes distracting and only serves to point out the fact that - hey, this movie was filmed in Grandpa Joe’s old barn and the abandoned lot down the street. John Glass’ BMX Guyver-inspired body armor is a pretty stunning piece of costuming, but the rest of the movie suffers from an inventive, but ultimately homemade appearance. While it isn’t unrealistic to assume that people living in a post-apocalyptic future will wear hoodie sweatshirts to protect themselves, I wasn’t entirely convinced that the characters were actually supposed to be wearing hoodie sweatshirts. As a result, it just looks cobbled together, like the costumes in those sweded movies you see online all the time. Since the back of the DVD packaging states that the movie is intended to be humorous, I was never quite sure if the costumes were supposed to look funny and crappy or if they actually just looked funny and crappy. Apparently the film is intended to be rife with jabs at the post-apocalyptic video game genre. This was evident in the numerous scenes in which John Glass uses his armor’s visor menu to check his heart rate, pulse, maps, GPS, load mission data, and I could go on and on. Have you ever just sat and watched someone play a video game? It’s pretty fun when they’re engaged in some form of action or solving a puzzle, but when they spend 10 or 15 minutes just organizing their loot and checking to see exactly what weapons they’ve acquired and what missions they’ve yet to accomplish, it gets pretty boring. You might even fall asleep. Unsurprisingly, I did too. If this tedium was intended to be interpreted as humor, it failed. Large portions of the film were long, boring shots of John Glass walking and talking to himself in soliloquies which were apparently written by a ninth-grader while music blared in the background. To be fair, the music was pretty good. The narrative? Not so much. Not that it mattered: the sound levels were so poorly balanced on this DVD, I constantly had to turn the volume up and down in order to hear anything anyone was saying, only to be blasted out of my chair when the music kicked in and I’m pretty sure I missed portions of the story. I guess I must be old. Now maybe this is a terrible analogy and maybe I’m rambling, but it comes down to this: Hellacious Acres had a few moments where it was truly original and visually quite appealing, but ultimately I felt as though I was watching a film in a different language with no subtitles. There always seemed to either be something missing or an abundance of effects and tricks intended to cover up a sparse plot because the viewer was expected to be stoned out of their minds when they watched it. I know I wish I had been. The filmmakers definitely seemed to have some sort of vision and on a few occasions they may have actually achieved it, but I was never able to completely lose myself in it because it never got past the point of just being a bunch of dudes in hoodie sweatshirts and rubber dishwashing gloves wielding acetylene torches under the haze of some trippy camera effects and fog machines.